Had I not ended up with the American Red Cross, I would have spent my Fulbright year at the Zonta International Headquarters in Chicago. Often the easiest way to explain what Zonta International is about is to say that it is like Rotary or Lions Clubs, but (originally) for women. The official story goes like this: Founded in 1919, Zonta International is a global organization of executives and professionals working together to advance the status of women worldwide through service and advocacy. With more than 30,000 members belonging to more than 1,200 Zonta Clubs in 63 countries and geographic areas, Zontians all over the world volunteer their time, talents and support to local and international service projects, as well as scholarship programs. 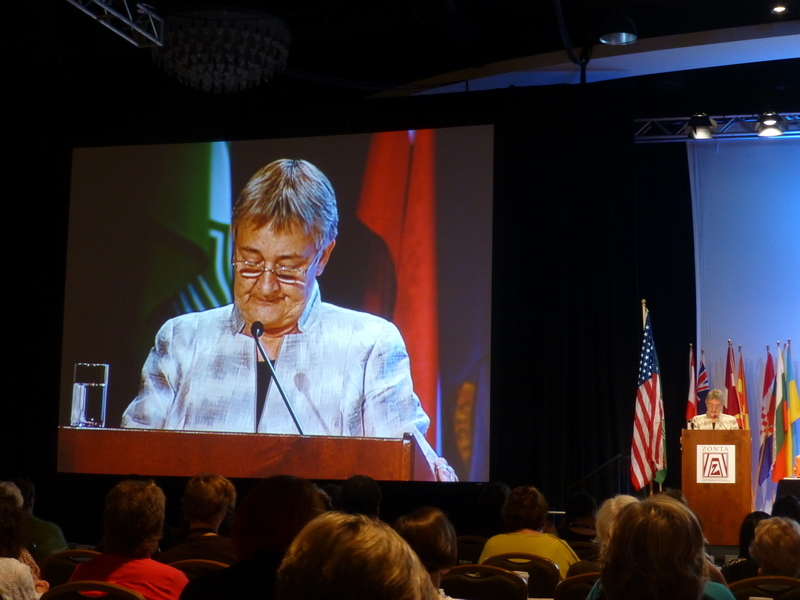 Zonta International, its districts and its clubs are nonsectarian and nonpartisan. Even if DC was my destiny instead of Chicago, I was able to get involved with the American activities of Zonta International a little bit as well. The Zonta Club of Washington, D.C. welcomed me to their dinner meetings with open arms. I have been a member of one of the Finnish clubs, Zonta Club of Helsinki 1, since 2008, but this was the first time I attended a meeting of another club. It was fascinating to see how they operate, and I made a lot of notes about ideas that could benefit our club. For example, the website of the DC club is an excellent benchmark for our club. I also loved the fact that PayPal was used actively for dinner payments, reducing the need for handling cash in the meetings. 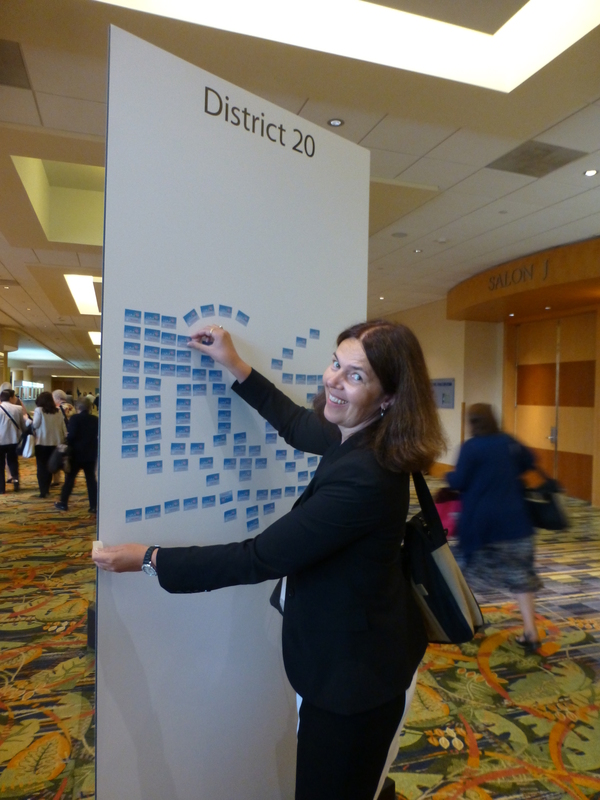 In addition to getting to know Zontians in DC, I attended the Zonta International Orlando Convention 2014 in Florida as one of the two official delegates of our Finnish club. 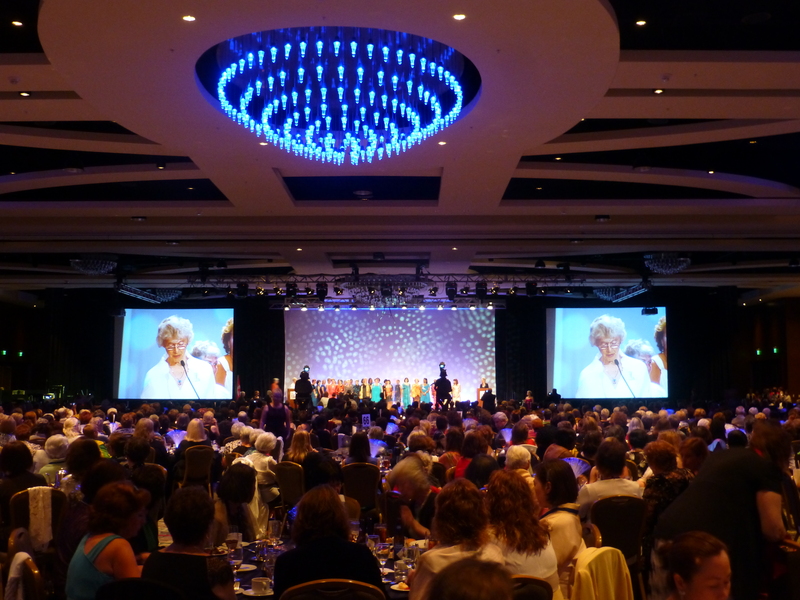 Zonta conventions take place every other year. Thousands of Zontians from around the world gather to make decisions regarding the goals of the next biennium and to elect the new Zonta International officials. I had been told that one truly understands what Zonta is about only after attending a convention. This is definitely a valid point. The event made it very concrete how extensive and powerful the Zonta activities are on the global level. At the same time it was a serious reminder how much there remains to be done to advance the status of women. 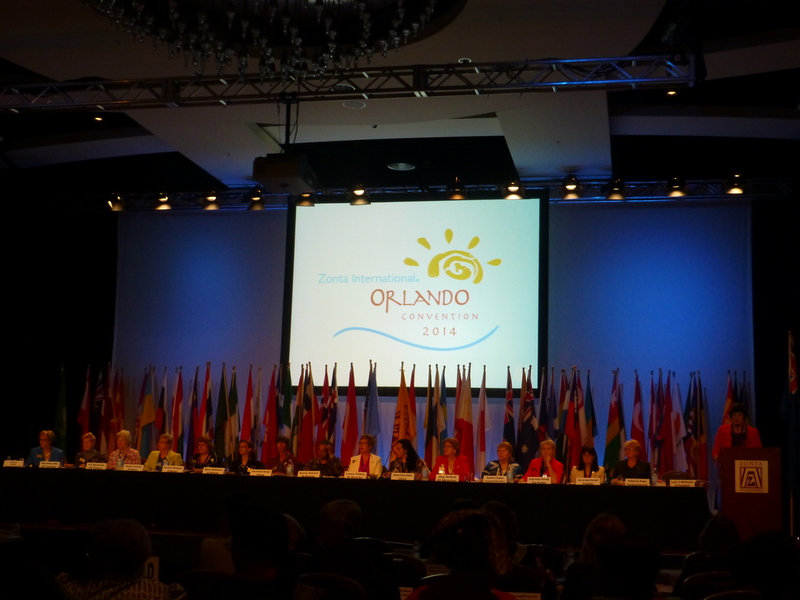 Below are my highlights and remarks of the Orlando convention. I arrived at the convention site already the day before the actual convention started. This turned out to be quite lucky, because a management training workshop aimed at the future Vice Governors and Club Presidents was opened to anyone interested last minute. The workshop on “Effective Conflict Resolution in Organizations” was an excellent way to spend the afternoon with ladies from all corners of the world from Hawaii to Germany and Chile. The trainers walked us through different collaboration and decision-making styles and made it easy to see how differences in these sometimes may make club activities (or life in general) challenging. 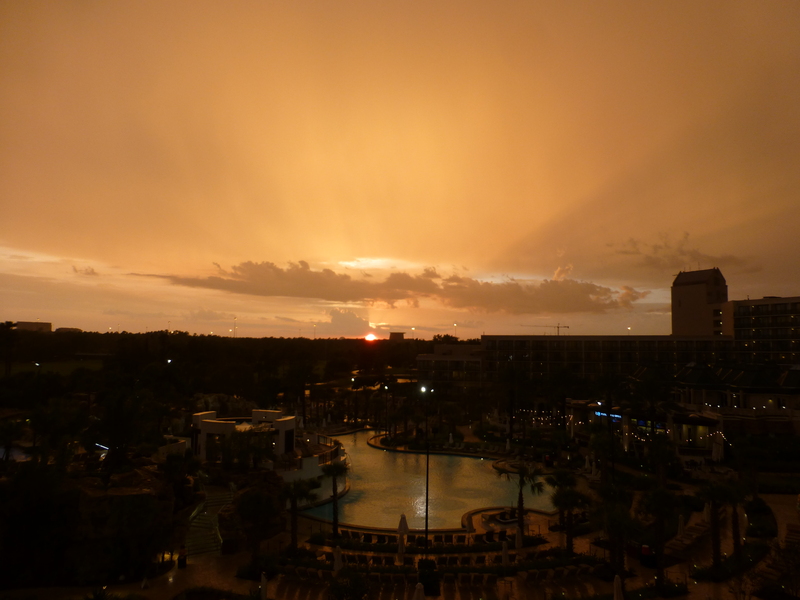 The convention took place at the grandiose Orlando World Center Marriott, also known as “the luxury prison” as a Dutch Zontian put it. There was no way to leave the resort without a cab or a rental car. One of the highlights of the life in the prison were the gorgeous sunsets seen from the balcony of our cell. Later at night we could also see the Disney World fireworks at the distance. The theme for Friday was delegate training which was particularly helpful for us who were attending a convention for the first time. There is more to learn about parliamentary decision-making among thousands of women than one might think. It was very helpful to get an introduction to the hierarchy of different rules and procedures that regulate Zonta activities on international, district and club levels. At the convention, the focus is on the international bylaws that are like the constitution of the organization. The decision-making process follows Robert’s Rules of Order Newly Revised. In a lot of cases the first vote is about the decision-making method. If a change is proposed to the original proposal, there may be a vote on the formulation of the proposed change. Finally, there is a vote between the original proposal and the proposed amendment. This opens up interesting opportunities for smart meeting tactics. Unfortunately, it also leaves plenty of room for human error. It seemed pretty clear that not all participants understood enough English and/or Boolean algebra to be able to stay on top of what was being voted at each moment. In practice, most decision-making happens by electronic voting. The voting machines are super simple small devices, but when you put them in the hands of ladies of all ages with different cultural backgrounds, there is no such thing as super simple. Quite a lot of time was spent practicing the use of devices. Even the technology provider was struggling with all the troubleshooting as it is not common even for them to have several thousand people voting simultaneously. The official Opening Ceremony of the conversation served as a walk-through of the history of Zonta International at the same time: The flags of all Zonta countries and territories were carried to the stage in the order of years when the first Zonta club was founded in each area. The keynote speaker was Phumzile Mlambo-Ngcuka, United Nations Under-Secretary-General and the Executive Director of UN Women, who thanked Zonta International for our continuous support of the mission and work of UN Women. 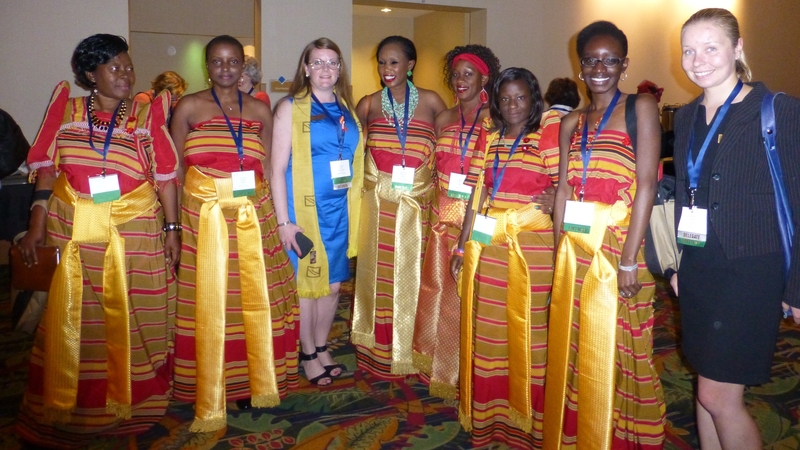 Seeing thousands of women from around the world in the same huge ball room, many dressed up in their beautiful national costumes, like the Zambian women below, made it very concrete how global the organization is. After the Opening Ceremony we managed to escape the prison for a moment and took a cab to a nearby Walmart. Together with my partner in crime, the other delegate of our Finnish club and my convention roommate, we stocked up with healthier, tastier, and more reasonably priced breakfast and snack items than anything that was available at the hotel. With sneaky smiles on our face returned to our prison with our catch, and created a temporary minibar extension out of a champagne cooler and loads of ice cubes. 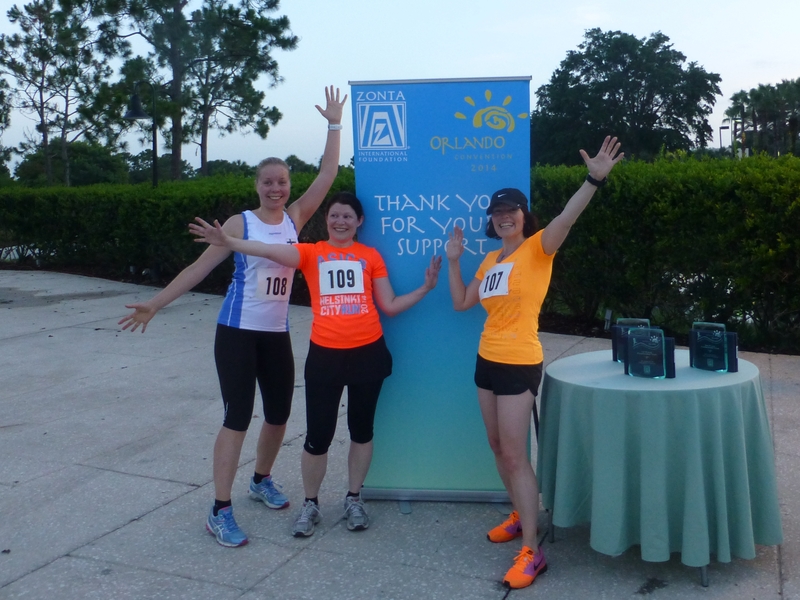 Our Saturday morning started with the Zonta Rose 5K Run/Walk. The start was already 6AM, as the run course circled around the Marriott golf course. For safety reasons, we needed to be out of the way before a golf tournament started. As Orlando is very hot and humid in June, I did not mind the early wake-up and slightly cooler temperature at all. A good number of Zontians had decided to join the fun. The total funds raised for Zonta International Foundation with the event were more than $45,000. Later during the day, it was finally time to start the actual business sessions of the convention. The first one consisted of all kinds of formalities: recognizing the 2012-2014 leadership team, voting to approve the standing rules, accepting the convention program by unanimous consent, and listening to the reports of the president, treasurer, and secretary. The remaining business sessions were spent listening to the speeches of the 2014-2016 leadership candidates. Apparently, this part of the program has traditionally been always running late, but not this year: The microphones were strictly muted after each candidate had used their allocated slot (2-3 minutes depending on the position the candidate was applying for). I could immediately see loads of use cases for this type simple and brilliant technology in multiple other areas of life as well. As the business sessions did not run late against all expectations, all of a sudden we had some free time at our hands. Completely unexpected in the middle of the action-packed convention agenda! As many Zontians who had flown to the convention all the way from Finland were very keen on doing some shopping, it was time to escape the prison again and head to an outlet mall for some Orlando style quality time. We spent practically the entire Sunday in the dungeon, the same huge dimly-lit ball room that did not only host the opening ceremony but actually pretty much all the other activities as well. 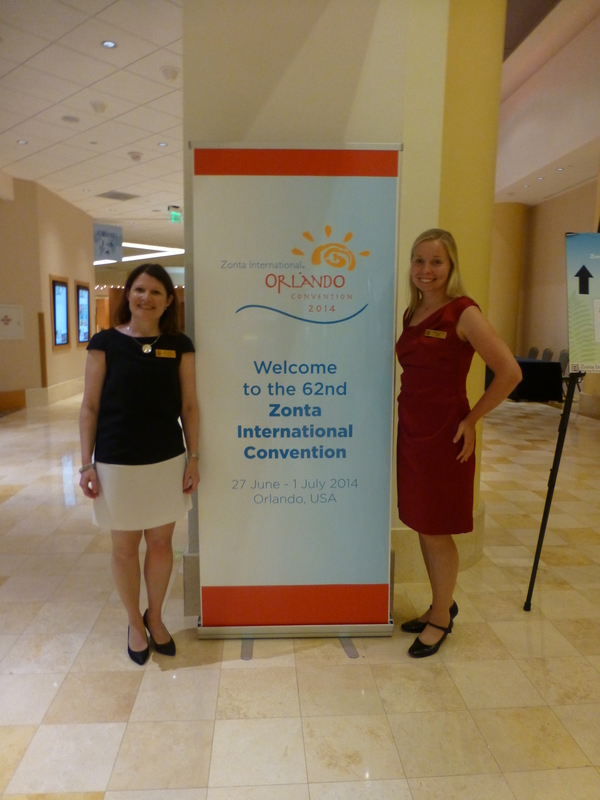 The day started with the elections of the 2014-2016 Zonta International officers, directors and nominating committee. Luckily the voting devices worked just fine despite the technical challenges during the Friday practice. Next, we got to enjoy three excellent speeches given by Jane M. Klausman, Young Women in Public Affairs and Amelia Earhart scholarship recipients. Who would’ve thought that someone can give an unforgettably fascinating speech about space debris? Well, that’s what the aerospace PhD candidate Laura Suarez Henderson did! No wonder these young ladies had scored the scholarships. Then we moved into the most serious and notorious business sessions of the convention, the bylaws. The Zonta International leadership and headquarters staff had put in a major effort in going through the bylaws in detail prior to the convention. Hence there was a record high number of proposed changes. The guiding principle of the proposals was to streamline the actual bylaws by moving unnecessary details to manuals that can be updated with less bureaucracy also between conventions. Several delegates considered each such change as a presumptuous attempt to shift power from the convention to the international leadership. This led to fiery discussions on even the most trivial sounding proposals. For a convention first-timer, it was quite confusing to see that a number of delegates were so passionate about the bylaws that they even lost their temper during the business sessions. And it was equally confusing that there were a number of proposals from local clubs to include very specific practical details that happened to be important to them to the international bylaws. Seeing this side of the parliamentary process was very eye-opening and educational. Fortunately, the voting results still reflected that the majority of the delegates understood the big picture, picked their battles, and had lots of common sense. As so many delegates had wanted to have a say about the bylaws on Sunday, the conversation had to be continued for hours on Monday as well. After loads of debate, all the revisions to the bylaws were completed on Monday evening. In the end, there were only a few very significant changes. Echoing the words that a frustrated elderly Australian Zontian said in the elevator, maybe all the drama around the bylaws was not the best use of the time of professional women that had flown in from all over the world. The lengthy bylaws debate unfortunately meant that the delegates missed the workshops that I had very much looked forward to. The workshop on Philanthropy and Women would have been very relevant for my Fulbright project, and attending the Women in Leadership workshop led by Marilyn Waring would have been an honor as such. Luckily, her excellent keynote speech remained on the agenda despite the schedule changes. This impressive woman, the Professor of Public Policy at Auckland University of Technology, was as elected in the New Zealand parliament as the youngest woman at the age of 23. She has made an incredible career as a politician and activist for female human rights and environmental issues. She was nominated for the Nobel Peace Prize as a part of the 1000 Peace Women initiative. Together with American Nobel Peace Laureate Jody Williams, Marilyn Waring definitely belongs to the top of the list of the most inspiring persons that I came across during my Fulbright year. 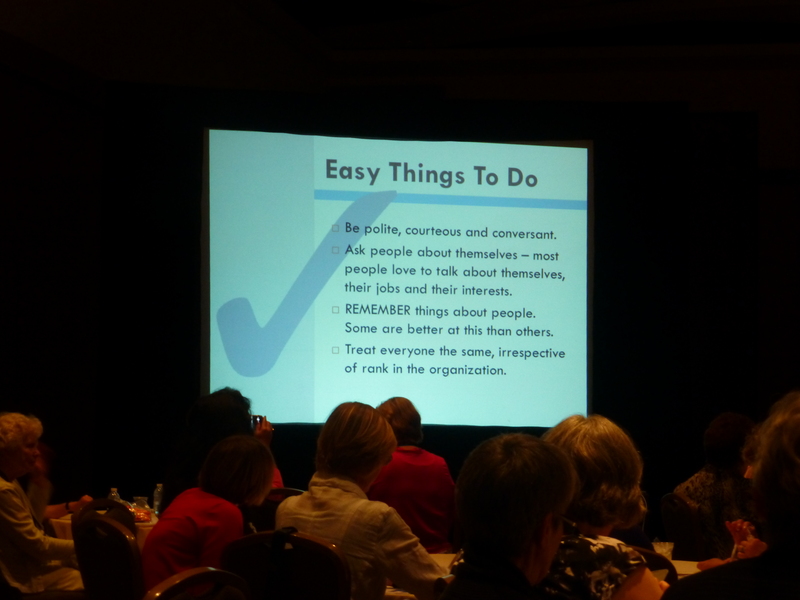 Even if I missed the Philanthropy and Women workshop, the convention gave a lot of perspective to that topic as well. In addition to the Zonta Rose 5K Run/Walk, there was another major fundraising effort during the convention as well. The Zonta International Foundation had a booth at the convention site giving the convention participants an opportunity to make their first gifts of the 2014-2016 biennium in person and with instant gratification. The concept was that donors got a blue “I Gave” sticker for each $25 donated during the convention. These stickers were then placed on the district leader boards that were kept visible in the lobby to trigger competition between districts on which one had given most. Additionally, donors also got an official Orlando “I Gave” pin that they were able to wear right away. Nearly $170,000 were raised by sticker sales. Astonishing, isn’t it? To learn more about these projects and other topics of the Orlando Convention, please check out these materials and highlights. After blessing the plans for the next biennium, we finally had some time to enjoy the glamorous pool area of our luxury prison and try out the thrilling water slide. I even managed to find a deserted indoor pool where I was able to swim a couple of laps before heading to the gym to spend a few moments on a stationary bike and a treadmill. My modest attempt to get at least some triathlon training done during the convention! Then it was already time to get ready for the fancy Closing Banquet and Installation Ceremony. In the traditional Installation Ceremony old and new international and district leaders gathered on the stage. The new President Maria Jose Landeira Oestergaard gave her inaugural speech. 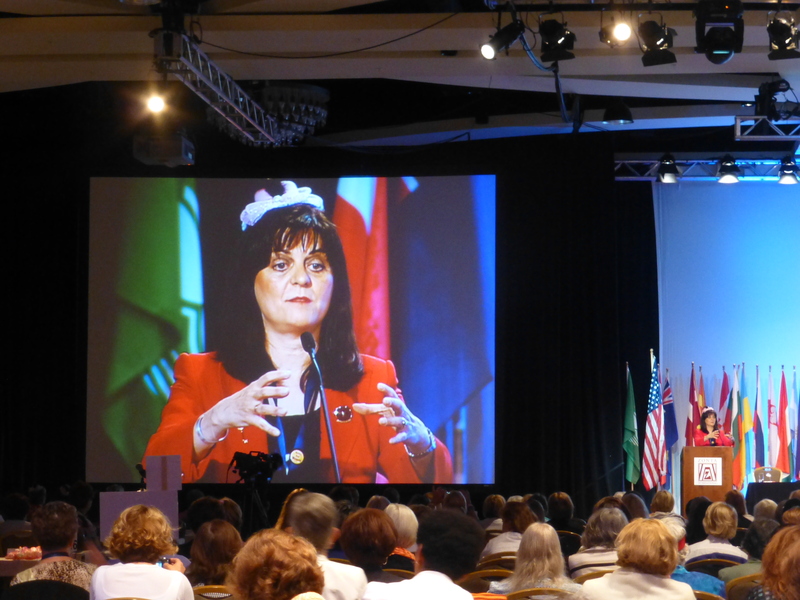 The President for the Biennium 2012-2014 Lynn McKenzie became a “PIP”, a Past International President. PIPs enjoy a special status and rights, e.g. they have the right to vote in Zonta conventions without being club delegates. For me personally, it was touching to see these ladies on the stage as they both were very supportive during my Fulbright application process. (I even met up with Lynn McKenzie in Wellington in January 2013!) In addition to the Installation Ceremony and the delicious dinner, the ultimate highlight of the Closing Banquet was a spectacular performance by Cirque du Soleil. If you have a free morning in Orlando before heading back home, what is the most culturally appropriate thing to do? Visit the Disney World, of course! 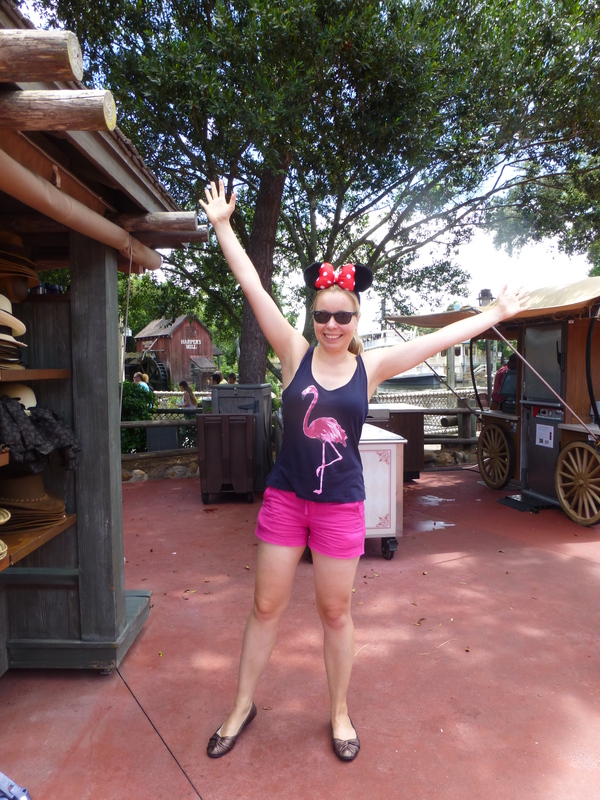 It is not quite as straightforward as one might think, though, but luckily there are articles like 101 Great Disney World Tips that help you get oriented. Our strategy was to head straight to the Magic Kingdom and be there a little before the park opens. 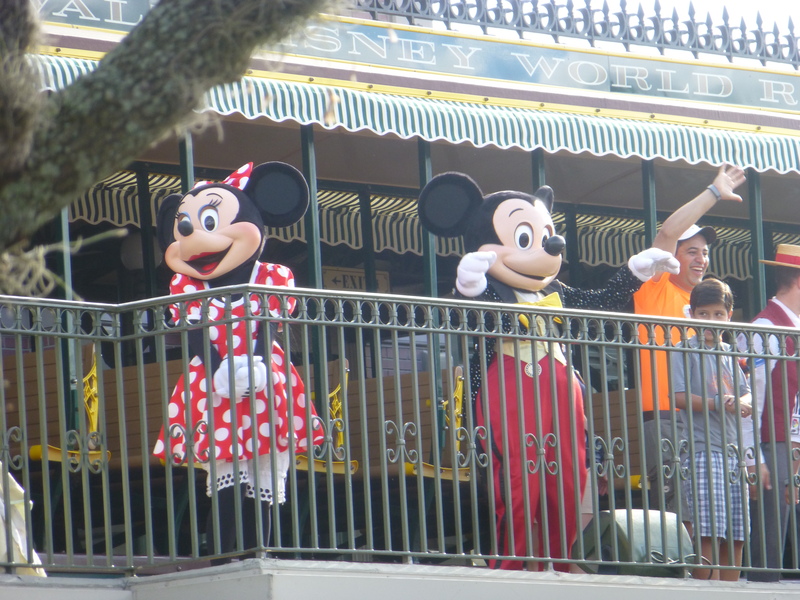 The plan worked beautifully, and we started our visit by witnessing the arrival of Minnie, Mickey & co to the park by a small train. Then as soon as the gates opened, we more or less ran to our top priority attraction, Space Mountain, and got to hop on this insane roller coaster practically without any waiting in line. Later during the day we got our share of that as well, though. But still it was a positive surprise to be able to squeeze in several additional rides as well, like Seven Dwarfs Mine Train and Big Thunder Mountain Railroad. Finally after getting a chance to pose wearing Minnie Mouse ears, I could really feel that my Orlando experience was complete.